In any case, I stumbled on one of the better examples of a New York “Texas Hot” hot dog stand in Corning, NY. Featuring one of the most unassuming storefronts I’ve ever seen, in which the business name “Jim’s Texas Hots” is only scrawled in ballpoint pen on a tiny sheet of paper listing the hours (oddly, the back of the store has a much bigger sign). But, both the overall appearance, my weird fascination with narrow restaurants, and the relatively high number of people going in and out forced me to check it out. So I ended up with a “Texas Hot” with onions and chili (left), and the “Maine Hot” special, with cheese, sauerkraut, onions, and chili. And, indeed, both were very good basic hotdogs, especially for the princely sum of $1.40. Yeah, I’ve had a better hot dog, and I’ve certainly had better chili and/or Coney sauce. 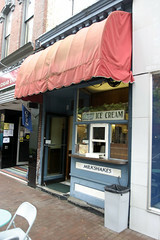 But, overall, the quality, friendliness of the staff, and the ambiance made this a pretty good place to drop in for a quick snack. if you ever get to Grand Rapids, MI, you must try Yesterdog in Eastown. and, incidentally, my mom grew up near Corning. Did you get any glass? I’ll have to look for Yesterdog next Michigan trip. Yes, I did get some glass, and even did the glassblowing thing. And I’m actually a Corning native. 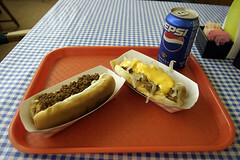 I used to work there as I am also native of Corning and to me it is the best hot dog. I never really noticed the lack of signage, but clearly as you point out is slightly problematic. It is always a place I go and you must add Red Hot for the Texas hot. Unbelievable. Thanks, I’ll check them out the next time I’m in the area.